Please be aware that you must arrive before 7:00 am and 4:00 pm if you would like to use the pedestrian crossing at the Rocky Creek site. If you arrive after 7:00 am or 4:00 pm, even if it is a short while after, you may be turned away. (1) A massive mudslide consisting of multiple rocks and dirt will continue to keep Highway 1 closed in both directions at Alder Creek(Post Mile 8, but closure is from PM 8-PM 9.5), which is 37 miles south of Big Sur for at least a week. As a result of this recentslide, Hwy. 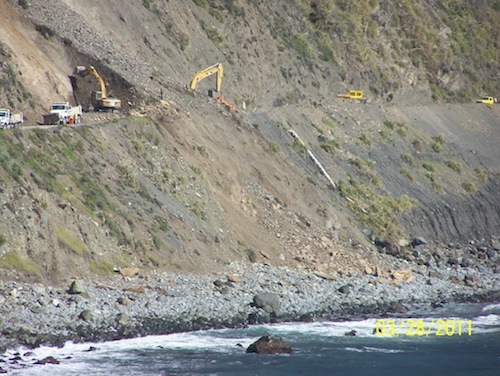 1 continues to be temporarily closed on both sides of Big Sur — Rocky Creek to the north and Alder Creek to the south.Crews/contractors are working from dawn until dusk every day to open the roadway as quickly and safely as possible. Motoristsshould remain very alert as conditions can change at any moment. Unless conditions change, Caltrans will issue anotherupdate on Friday, April 1. (2) Due to severe roadway damage to the southbound lane, a 2-mile section of Hwy. 1 at Rocky Creek (Post Mile 60.5) continues to be closedin both directions. However, pedestrians continue to be escorted through a half-mile section from one end of the slide to the other at TWOdifferent times: 7 AM AND 4 PM PROMPTLY. Bikes are also okay during these escorts. People are asked to park in the Bixby Creek/Old Coast Road turnout at the south end, and the Rocky Creek Bridge turnout at the north end. These access times are available to allmembers of the public. • Vertical nail installation for the roadbed retaining wall is 70% done and should be fully complete by the end of tomorrow, March31. Horizontal nails will then be installed. This site is an active construction zone and the slope remains unstable so the roadway isunsafe for public access. Inclement weather and geologic instability continue to be a factor in roadwork progress.• CHP is on site at both slides to secure the area and ensure public safety.• Community officials continue coordinating with Caltrans and CHP to provide limited helicopter shuttle service from Rocky Point restaurantto Little Sur River Bridge which began Monday @ 10 am.• Next goal will be to provide convoyed vehicle access across the northbound lane, but no ETA is available at this time.• It is anticipated that there may be a 5-ton restriction for all vehicles, once the northbound lane is re-opened to vehicle traffic.This is critical for all businesses to be aware of since it may preclude many motor homes, passenger buses and most deliverytrucks from using this part of the highway. There may be additional vehicle length and trailer restrictions as well, pendingfurther analysis by Caltrans traffic engineers.• Completion time for providing vehicle access with signal light control on the northbound lane is now estimated to be at the endof April. (3) Traffic continues down to one lane just south of Lucia at Dani Creek (PM 22.6-22.8) with a temporary signal inplace for retaining wall installation. Roadwork hours are from 7 am to 5 pm daily with work expected to be completedthis summer. Cyclists traveling southbound are required to press the signal button to activate a longer period in order tosafely get through the narrow one-way uphill section. (4) The temporary signal about two miles south of Lucia at Pitkins Curve/Rain Rocks (PM 21.3-21.6) for thebridge/rockshed project remains in operation 24/7 with the project expected to be completed in winter 2012/2013. SAN LUIS OBISPO COUNTY:A culvert repair project is taking place at various locations starting just south of Hearst Castle to four miles south of the San Luis Obispo/Monterey County Line. One-way reversing traffic control on weekdays from 7 am to 4 pm with up to 15-minute delays anticipated. Project isexpected to be completed in June 2011, weather permitting. For more information on Monterey County projects, call the toll-free hotline at (888) 836-0866 or visit http://www.dot.ca.gov/dist05/projects/. Also,contact the statewide CHIN at (800) 427-7623 for highway traffic updates. Just click on Needs or Offers and you can post anything that you need or would like to offer. I am offering to pick-up people at the 7am pedestrian crossing at the washout site. (1) A massive mudslide consisting of multiple rocks and dirt will continue to keep Highway 1 closedin both directions at Alder Creek (Post Mile 8, but closure is from PM 8-PM 9.5), which is 37 miles south of Big Sur for at least a week. As a result of this recent slide, Hwy. 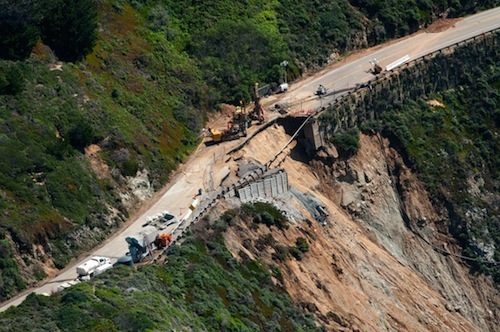 1 continues to be temporarily closed on both sides of Big Sur — Rocky Creek to the north and Alder Creek to the south. Crews/contractors are working from dawn until dusk every day to open the roadway as quickly and safely as possible. Motorists should remain very alert as conditions can change at any moment.Caltrans will issue another update tomorrow Wednesday, March 30. (2) Due to severe roadway damage to the southbound lane, a 2-mile section of Hwy. 1 at Rocky Creek (Post Mile 60.5) continues to be closed in both directions. However, pedestrians will be escorted through a half-mile section from one end of the slide to the other at TWO different times: 7 AM AND 4 PM PROMPTLY, beginning tomorrow, March 30. Bikes are also okay during these escorts. People are asked to park in the Bixby Creek/Old Coast Road turnout at the south end, and the Rocky Creek Bridge turnout at the north end. · Crews assessing the roadway have tentatively determined that, at the earliest, it will be the end of April for a temporary repair to occur. Inclement weather and geologic instability continue to be a factor in roadwork progress. · Condon Johnson & Associates of Oakland is the contractor for this $2.5 million emergency project. They are in the process of installing vertical soil nails in order to stabilize the remaining roadway section. This site is an active construction zone and the slope remains unstable so the roadway is unsafe for public access. · CHP is on site at both slides to secure the area and ensure public safety. · Community officials continue coordinating with Caltrans and CHP to provide limited helicopter shuttle service from Rocky Point restaurant to Little Sur River Bridge which began yesterday @ 10 am. (3) Traffic continues down to one lane just south of Lucia at Dani Creek (PM 22.6-22.8) with a temporary signal in place for retaining wall installation. Roadwork hours are from 7 am to 5 pm daily with work expected to be completed this summer. Cyclists traveling southbound are required to press the signal button to activate a longer period in order to safely get through the narrow one-way uphill section. (4) The temporary signal about two miles south of Lucia at Pitkins Curve/Rain Rocks (PM 21.3-21.6) for the bridge/rockshed project remains in operation 24/7 with the project expected to be completed in winter 2012/2013. Current priorities for Rocky Creek slide area and Alder Creek slide area: #1 Safety, #2 Production, #3 Access. Production is a higher priority at Rocky Creek than access due to current volume of sand that is eroding below road base. If retaining wall is not finished before cumulative erosion becomes problematic, there could be a failure of the north bound lane road bed. Factors that influence all decisions going forward are Weather, Stability of the soils in the slide area, and Real Estate (area around road bed and slide area where construction, repair, and access activity can occur). · Beginning Wednesday, March 30 pedestrian access across the north bound lane will be permitted twice daily at 7:00 AM and 4:00 PM. All pedestrians (including those with bicycles, which must be walked through the slide area access corridor) must be assembled at either the north or south end of the physical closure at 7:00 AM and 4:00 PM to be allowed access. At each access time, all pedestrians on both ends of the physical closure will be escorted through the slide corridor. As soon as each assembled group is escorted through, the access will be closed until the next access time opening. The current times were chosen to accommodate the needs of the school district and the middle and high school students. These times and the frequency of access times are all subject to change if conditions in the slide area change. · All vehicles used to transport pedestrians to the slide area need to be parked in the following locations. South end of slide – vehicles should be parked on the sides of the County Road and care should be taken not to block the roadway or vehicles will may be towed. North end of slide – vehicles should park in available turnouts, though not the turnouts adjacent to Rocky Creek Bridge. Vehicles that are parked in such a manner that they encroach on the highway or block access to construction vehicles may be towed. Vehicles parked in turnouts will not be subject to ticketing for overnight parking. · These access times will be available to the public, not just local residents. · Vertical nail installation for road bed retaining wall is 2/3 complete and should be fully complete by end of day Thursday, March 31. Soil (horizontal) nails will then be installed. · Next goal will be to provide for convoyed vehicle access across the north bound lane, but no ETA is available at this time. · It is anticipated that there will be a 5 ton weight restriction for all vehicles, once the north bound lane is re-opened to vehicle traffic. This is a critical item for all businesses to be aware of as it may preclude many motor homes, passenger busses, and most delivery trucks from using this part of the highway. This limit will likely be in place until south bound lane is rebuilt, which may take up to a year or more. Thus all vehicles over the weight limit will have to travel to Big Sur from the south and return the same way. There may be additional vehicle length and trailer prohibitions as well, pending further analysis by Caltrans engineers. · Completion time for providing vehicle access with signal light control on the north bound lane is now estimated to be sometime in the last week of April or 30 days from the beginning of construction on March 23, 2011. Alder Creek slide doubled in size last night and is now expected to take up to a week to re-open the highway at that location. Efforts are underway to work with Monterey Salinas Transit to provide bus service to the Rocky Creek Slide area both to and from the Monterey Peninsula and within the Big Sur valley.